A chest X-ray is a quick and painless imaging test that uses electromagnetic waves to create images of the structures in and around the chest. A chest X-ray may be performed to diagnose pulmonary or cardiac disorders. It is also helpful to diagnose and monitor various lung conditions such as pneumonia, emphysema, and cancer because it spots abnormalities of the airways, blood vessels, bones, heart, and fluid collection in or around the lungs. X-ray of the chest is also used to view the size and shape of your heart. Abnormal size and shape of your heart can indicate issues with heart function. 1 When to get a Chest X-Ray? 2 Do X-rays expose you to radiation? 3 Is the radiation used in X-rays harmful? 4 How is Chest X-ray performed? 5 How long does it take to finish an X-ray? 6 When will I receive my results? 7 How do I prepare? Do I need to fast? 8 How do I book my Chest X-ray appointment? When to get a Chest X-Ray? CT Scan (Chest) to capture detailed pictures of the affected area in the chest. CT Angiography (Chest) to capture detailed images of the blood vessels in the heart. Do X-rays expose you to radiation? Yes. X-ray is an imaging test which involves a small amount of ionizing radiation to show pictures of the organs, tissues, and bones of the body. Is the radiation used in X-rays harmful? No. Once you finish the examination at the X-ray center, the radiation does not remain in your body. Thus, X-rays have no side effects. How is Chest X-ray performed? Once you arrive at the center, you will be taken to the X-ray room after registration. 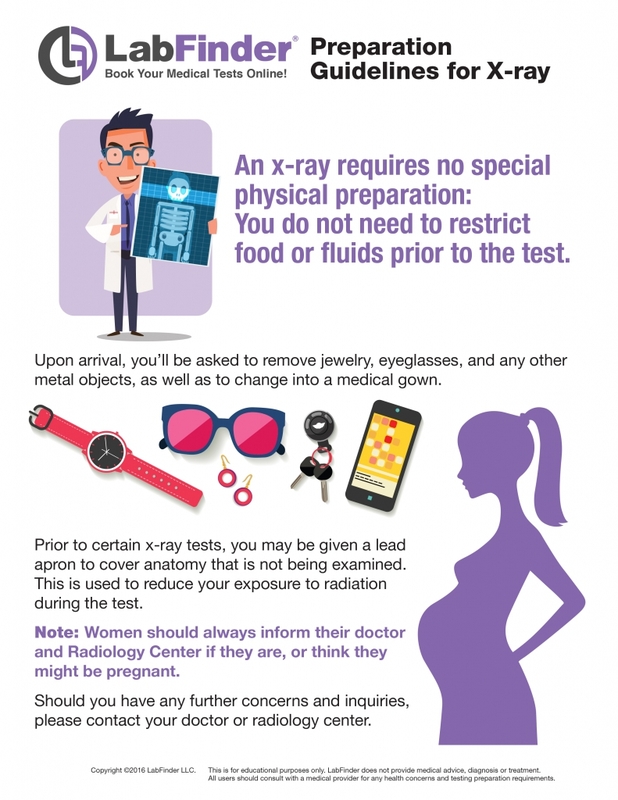 In order to prevent any interference with the radiation, you will be asked to take off your clothing, accessories, jewelry, etc., and wear a medical gown. The X-ray technologist will then instruct you to stand against the photographic film/image recording plate. The X-ray machine will be placed at least 15 inches away from you. It will then produce a beam of radiation that will pass through your body and record an image on the film. For a chest X-ray, two views of the chest—back and side—are captured. What is the duration of the Chest X-Ray? The complete chest x-ray examination, from positioning to obtaining and verifying the images, takes about 15-20 minutes at any X-Ray center. Once the chest X-ray is completed, you will receive your results within 3-5 business days in your LabFinder portal. Please refer to the simple preparation guidelines given below or consult with your doctor or radiology center where you are being treated. Do not forget to bring your LabFinder Order and Insurance Card to your appointment. How do I book my Chest X-Ray appointment? You can find information about an X-ray center near you at labfinder.com and make an appointment online instantly!